Real moms talk about the best workouts for busy moms. Motherhood — there’s no employee manual, vacation time is never actually given because you never truly stop thinking about them and it’s been said it’s the toughest job you’ll ever love. So why do we do it? What keeps us going? The answers are fairly simple, but often can be easier said than done. No matter what the activity is, time away from children isn’t neglecting their needs. In fact, it often means becoming a better mom. And it doesn’t have to take away from being a good spouse, mother, or employee. 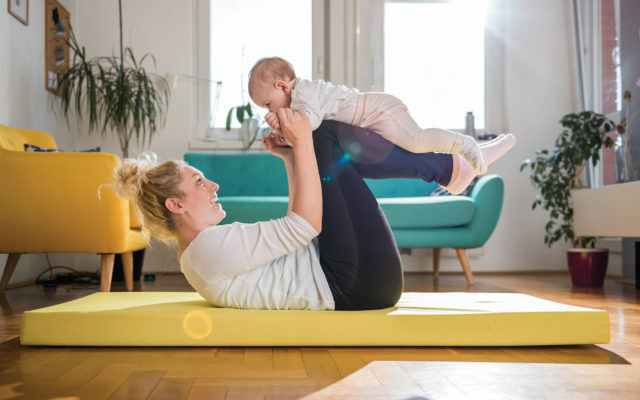 The articles about the benefits moms see when they exercise are seemingly endless, but how do you put it into practice? The honest answer: Any way you can. For some, it’s 10 minutes at a time whenever they can fit it in throughout the day. For others, it’s all about creating a routine or finding an exercise outlet they love. While some — mostly those with older children — make it a priority to get to the gym at least a few times a week. When you’ve got small children, or multiple kids who need to be chauffeured to and from activities, it can be difficult to make time to hit the gym. That’s when technology lends a hand. There are hundreds of apps, YouTube videos, and online resources for moms who find themselves with early mornings or late nights to get in their 30 minutes of activity. A few of the most popular include HIIT (High Intensity Interval Training), Jillian Michaels 20-Minute Workouts, and Beachbody On Demand. There is something to be said, however, about getting out of the house, interacting with other grownups and having adult conversation. Ashley Thornton, mother of two from Milford, agreed. Teaching children to be accountable for their food choices and activity is much easier when they see their parents participating in healthy behaviors and making nutritious choices. “[It’s] so important for our kids to see us move our bodies and be healthy,” said Michelle Sturgeon Lounsbury, a mom of two from Boston, Massachusetts. She noted the importance of strength training, but stated that simply walking has immense health benefits and is something everyone can do. “Walking is amazing for resetting those hormones when under times of stress, lack of sleep, etc., which can increase cravings for sugar,” she said. And then there’s the moms like Sharisse Roberts, aka Central Maine Roller Derby skater Feliz Bashit.